While I dislike the idea of making resolutions every year (we usually fail them, right? ), I do like the idea of finding subtle changes to make in the new year that will make this year even greater than the last. One of the big changes I'm making this year is to make more time for reading. I've always been an avid reader, and I never, ever feel guilty about purchasing a book. But even though my apartment has books lying around every year, it has been difficult for me to make time to read all of them. Circling back to those little changes for this year (wait for it...) my goal is to read two books each month. WOW I KNOW THAT SOUNDS CRAZY I FEEL CRAZY EVEN TYPING IT. Last year, I maybe finished 4 books. This year, my plan is to do that by the end of February. You know the term "biting off more than you can chew?" Dear goodness I hope I didn't just do that, because this is in writing now. 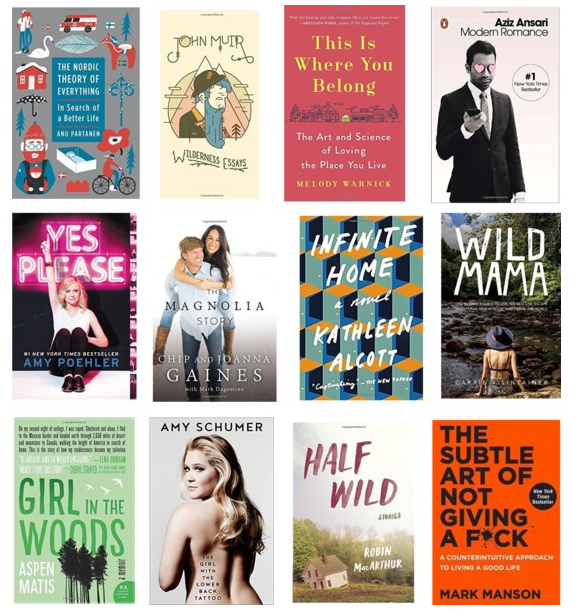 Below are the first 12 books I'll be *attempting to* read by the end of June. In my adult years, I tend to gravitate more toward non-fiction books, and am excited to dive in to these reads below (I'm already a few chapters into The Nordic Theory of Everything and it's so, so good). They say misery loves company, and while I'm by no means in misery reading these books, I would love for you to join me! ...aggressive cliche on my part? Clearly I'm not being any less dramatic in 2017.